I wanted to show you my swap card for Convention. I am very pleased how it turned out. I made 50 this year and all of them were swapped! Phew..lol. I really, really love the ribbon. It is great to work with. 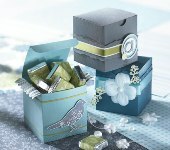 It is the 5/8" Organza Ribbon - it only come in Whisper White. I am now counting down! LOL Oh yes, I am over the half way mark in the pregnancy! This kid is VERY active. Mr O is excited while Miss M, well, she has no idea! LOL. It is 10pm Sunday night......Mr O's bag is packed ready for school tomorrow, clothes are out ready so I am going to log off, relax and watch some television before heading to bed. Night all! As my title suggests, our internet connection isn't very good at the moment so I won't be posting until it is back up and running properly. It is taking me twice as long to do things. Last week saw me fly to Melbourne for Stampin' Up! Convention 2011. For the first time it was over 3 days, not the usual 2 days. I roomed with my usual roomie, Nicky and we had a ball. I've got lots of swaps and I will show you some of them (once connetion is back to normal). Lots of news and lots of sneak peaks at upcoming sets for the 2011-2012 Idea Book & Cataogue. Can't say anything just yet so I'm afraid you will have to wait and see. One important bit of news from convention is that if you want to sign up to be a demonstrator, you no longer need to apply for an ABN (Australian Business Number). You can sign up online within minutes. However, once you start earing an income from Stampin' Up!, you will then need an ABN. How would you like to earn an extra $70 in hostess benefits??? If you host a workshop or place an order from the 23rd May until the end of June, you will qualify for the extra benefits. Your order needs to reach $450 in sales. Share your catalogue with your friends and gather orders from them to help reach $450. It works out to be $110 worth of products for free, just for you! You will get your usual $40 hostess benefits plus a level 1 hostess stamp set - then you get an extra $70 on top. Woo hoo! Are you ready for some weekly surprises? You may have seen our ad in the May issue of your favourite crafting magazine letting you know that throughout the month of May, we are bringing you a new deal on our exclusive products every week! 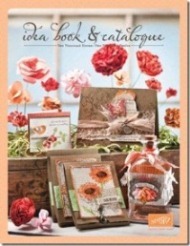 Check our website every Wednesday in May, and get up to 40 percent off a selection of incredible products from the 2010-2011 Idea Book & Catalogue! There are no limits to the number of Deals of the Week you can purchase and no minimum purchase is required. Now is your time to stock up on your favourite products! So that is it from me today. I hope the rest of your week is good.